I serve this with a salad but could be a side dish with some grilled meat. I almost always have zucchini, onions and grape tomatoes handy. This is adapted from a post by the Smitten Kitchen, one of the blogs I love. I accidentally put the filling in before I transferred the dough to the cookie sheet and it took the two of us to get it from the pastry board to the cookie sheet.. but we did it. it looked really pretty before that but still tasted great. Leftovers heat up very well. 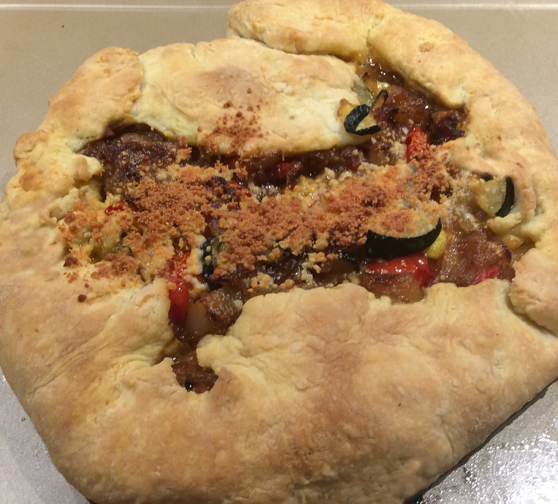 I also made the Galette with fresh plums for dessert – just forgot to take photos! 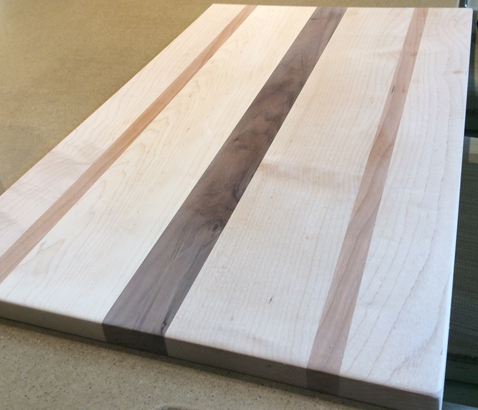 The pastry board was made by my wonderful, super talented Brother. 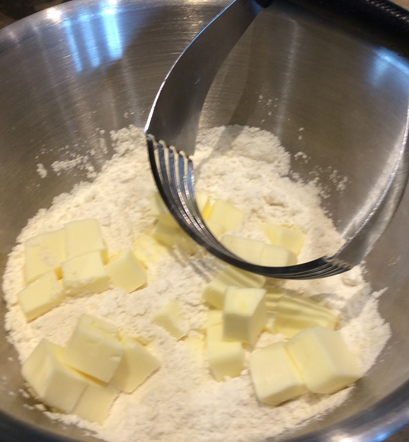 Make dough: Whisk stir the flour and salt in a large bowl. Sprinkle bits of butter over dough and using a pastry blender or your fingertips, work it into the flour until the mixture resembles coarse meal, with the biggest pieces of butter the size of tiny peas. In a small bowl, stir together the yogurt, lemon juice and water and add this to the butter-flour mixture. With your fingertips or a wooden spoon, mix in the liquid until large lumps form. Pat the lumps into a ball. Wrap with plastic and refrigerate for 1 hour, or up to 2 days. Make filling: Heat the oven to 400 degrees, Line a cookie sheet with tin foil and spread out the tomatoes in a single layer. Drizzle with about 2 Tbs of olive oil and sprinkle with course sea salt. i have never measured, just go by eye. Roast the tomatoes for about 20 minutes. While the tomatoes are roasting. Heat about 2 Tbs of olive oil in a large saute pan, caramelize the onions until golden brown. Add in zucchini and/or squash and cook until tender, about 2 minutes. Adjust seasonings if needed. Transfer mixture to a large plate and spread it out, so that it will cool faster. You want it cooled to at least lukewarm before assembling the galette. 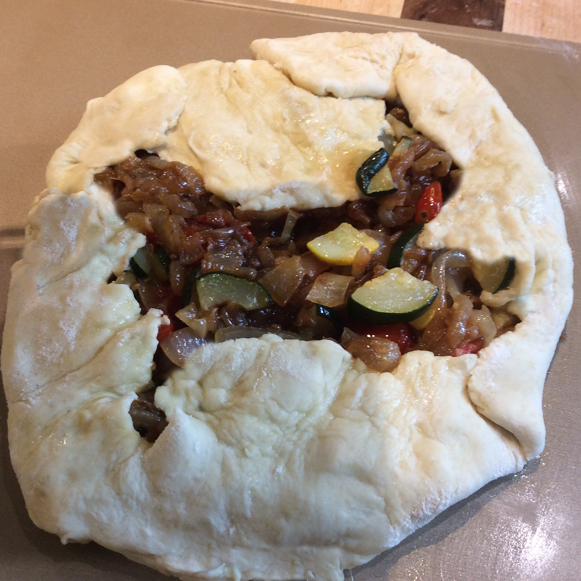 Assemble galette: Heat oven to 400 degrees. On a floured counter or board, roll the dough out into a 12-inch round. Transfer to a parchment-lined baking sheet; Sprinkle tomato-zucchini-onion mixture with half of parmesan and spoon the mixture into the center of the dough, leaving a 2-inch border. Use a slotted sppon so you don’t get any extra liquid. Sprinkle with almost all of remaining parmesan. Fold the border over the filling. The center will be open. Bake the galette: For 30 to 40 minutes, or until puffed and golden brown. Remove from the oven and let stand for 5 minutes, then slide the galette onto a serving plate. Cut into wedges and serve hot, warm or at room temperature.